You have to judge any product you use. Does it do what you want? Does it have hidden flaws that may bite you later on? You then have to make a decision based on your judgment and not just grumble. It’s amazing how many people claim to hate Facebook or Microsoft Word and keep using it in spite of the existence of many alternatives. If you use it, you have to decide how to use it. Even an annoying product can be more tolerable when used intelligently. A lot of software is distributed for the largest audience and is dumbed down in various ways. The iThingy has its infuriating auto-correct. Word has defaults which get in the way of formatting things the way you want. Firefox seems to intentionally make it hard to tell if you have a secure HTTPS connection. Some software is positively sneaky. I just launched the new version of Safari under OS X Mountain Lion and entered the so-called “private browsing” mode. 29 cookies mysteriously appeared, with domains including adsupply.com, advertising.com, google-analytics.com, huluad.com, and many others. Most if not all of these cookies were from sites I certainly haven’t visited since the last time I cleared cookies in Safari. I clicked “Remove all website data” and the number of stored cookies merely went down to 17. This puts Safari on my “don’t use if you can help it” list. Software makers have to appeal to sophisticated users as well as the mass market. Even if we’re small in number, we’re the ones who write about the apps and can wreck the reputation of a product we hate. To keep us happy, applications generally provide ways to tweak them, even if they’re hard to find. When I start using a new piece of software, I always spend time going through its preferences to make it work the way I want it to. Not everything is in the preferences, though. In Firefox, a lot of changes require going through the “about:config” page. If you try to change things, Firefox says this will void your warranty (What warranty? ), but you can change lots of things. You can tell Firefox you really want to know whether you’re on an HTTPS page (set browser.urlbar.trimURLs to false), that you don’t want animated GIFs (set image.animation_mode to none), and so on. To find out all the tricks, you have to search forums on the Internet. There’s a lot of good advice to be found — and even more bad advice, but with some effort you can usually tell the difference. Some people treat software like a store-bought appliance that they just plug in and use, but it should be approached more like a used car whose quirks you have to learn and deal with. The consequences of a crash may not be as traumatic with software, but it’s worth having a measure of control. It’s certainly better than just complaining. Is there a point to thinking about what a really free society could be like when freedom seems to be going down the drain? There is, as a matter of keeping a sane outlook. When we’re in a state of “war” with no prospect of an end, when governments are spending their way into bankruptcy and looking for more things to spend our money on, when we need to prove we’re allowed to work for a living, when traveling by air means submitting to the whims of goons, and when progressives and conservatives say that all this proves that we must have more government control as a remedy, it’s impossible to answer it all a piece at a time. It’s necessary to have an alternative vision rather than just fighting a futile defensive action. Even if there’s nothing left but to go down fighting, it’s better to fight for a vision worth having than just for the freedom to unlock a phone or to travel without having your luggage vandalized. I don’t claim to have all the answers for what a fully free society would be like. There are serious issues to be resolved in finding non-coercive solutions to some situations. But the lack of an immediate solution is only a reason to look harder. To the extent that people coerce others in order to get what they want, there’s a moral problem. The big goal of libertarianism isn’t to reduce government spending or to increase its efficiency, but to get rid of coercion as a social tool. (1) The problem of poverty. “Without coercive redistribution of wealth, some people would starve.” This is one of the weakest arguments. Governments do more to create poverty than to alleviate it. Through history, poverty has been largely the result of unequal application of the law. Rulers and politicians need the poor in order to give the impression of helping them. Eliminate cronyism, barriers to entry in business, and burdens on hiring, and the level of poverty would be much lower. Private help would be more than capable of helping those genuinely incapable of earning a living. (2) The free-rider problem. “There’s no way for private business to produce X and get paid by those who benefit from it, because people can get the benefits for free.” This is essentially the argument behind the DMCA and other draconian copyright legislation. This issue needs to be addressed in detail, but in many cases legislative attempts to make free riders pay just perpetuate ineffective business models. Letting some people have free rides may be the lesser evil in many cases. (3) The natural monopoly problem. With some goods and services, economies of scale and distribution make sustainable competition difficult. Roads and water supplies are examples. This issue does need serious work, and some free market economists have addressed it. One part of the solution is recognizing that property rights don’t apply in the same way in all contexts. We already recognize that unauthorized parking in a parking lot can’t be treated quite the same way as unauthorized parking on your front lawn, and owners of private roads don’t have the right to charge a million dollars for crossing the street. It isn’t necessary to solve all these problems completely for every possible case to regard the minimization (if not elimination) of coercive transactions as a moral ideal to pursue. If, in the ideal world, people still are compelled to pay for police patrols, it’s still a world worth aiming for. For most of human history, people couldn’t imagine a world without slavery. Essential services wouldn’t be performed! The ex-slaves would starve! The economy would collapse! Yet slavery has been pushed to the corners of civilization, even if it’s never been eliminated. The vast majority, if not all, of the coercive means of getting one’s way can likewise be outlawed, made something to hunt down and eliminate rather than something to get elected to do. It’s a long road that could take centuries to follow, but I can hope that people will someday be much further along it, rather than backing into authoritarianism. The Salvation Army puts on the appearance of a charity whose purpose is to help people in need, but it is a church, and it uses charity to promote its doctrines. I don’t give money to it, but it has a store and collection box near my home where I’ve often dropped off stuff I no longer need. After a mailing I got, I’m having second thoughts even about that. “He who believes in me will live.” The implication, supported by the SA’s doctrines, is that he who disagrees will die. The doctrine says that “all men have become sinners, totally depraved, and as such are justly exposed to the wrath of God.” Got that? 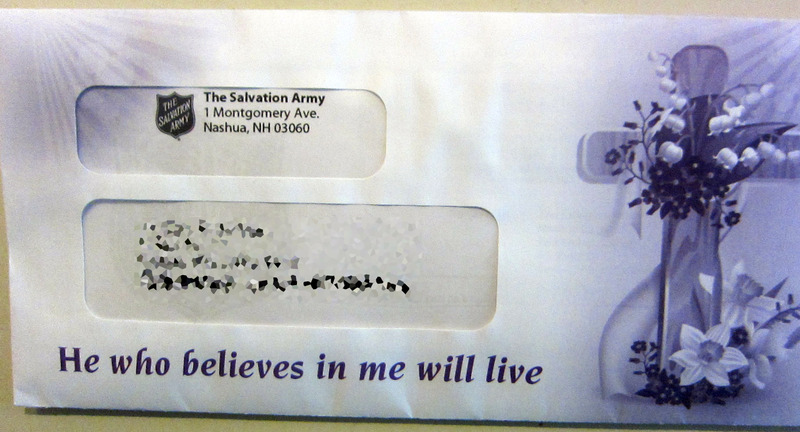 The Salvation Army thinks you’re a totally depraved person. To put the matter of regeneration in another way; regeneration is the impartation of a new nature, God’s own nature to the one who is born again (2 Peter 1:4). Every human being is born into this world with a perverted nature; his whole intellectual, affectional and volitional nature perverted by sin. … It is the Holy Spirit who creates in us this new nature, or imparts this new nature to us. No amount of preaching, no matter how orthodox it may be, no amount of mere study of the Word will regenerate unless the Holy Spirit works. It is He and He alone who makes a man a new creature. I just got home from my first trip involving a US airport in over two years. Hopefully it will be that long before I have to again. On the return trip, though, my plastic shopping bag of electronic stuff had been ripped open, and the contents were all over my suitcase. In addition, my box of Metamucil bars had been emptied into the suitcase and the bars in plastic wrappers were likewise all over the place. My camera, which I’d stuck into the middle of my laundry bag to keep it from getting bumped, was also loose. I can’t say at this point whether anything’s missing. Anyone can be hit by a random bag inspection, but what are the odds of its happening twice in a round trip? One possible explanation is the bumper sticker, “Congress represents me? I must be really evil!” that I have on it. It wouldn’t surprise me if the TSA is targeting any criticism of itself or the federal government in general. Update: When I tried to get the photographs off my camera, I got a “memory card error.” Taking the card out and putting it back in fixed it. This may or may not be related to the treatment it got from the TSA. At least no pictures were lost. For this post, I don’t think I need to add much to Bradley Manning’s testimony except to suggest that you read the whole thing. Here is one of the most important parts.